Usually, I'm a pretty easygoing guy, but I have my neuroses like everyone else. Within the shared confines of the train, I frequently see things that trigger them. In this blog post, I will share a few. Full coffee cup placed precariously on the empty middle seat. As I described in an earlier post, "Finding a Good Seat On the Train: The Xs and Os," the best commuting situation is a spot on a three-seater, either an aisle or window, where no one is in the middle. But sometimes my seat mate stresses me out in that situation. Why? Because he is drinking coffee and puts the cup down on the middle seat to turn his book page, send a text, etc. I'm staring at the cup out of the corner of my eye. 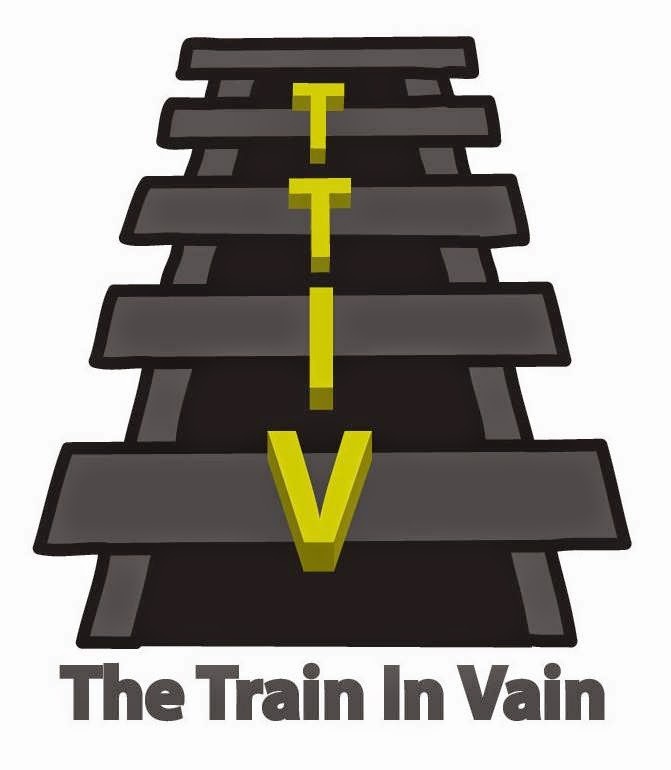 The train is going to jerk and I am going to wear that coffee. I have to say something to him. Should I say something? I think I'll say something. Do I really want to talk to this guy? No, not really. I'll just sit here and vigilantly watch his coffee. It better not spill on me. Ok, fine. I'll say something. SIGH. 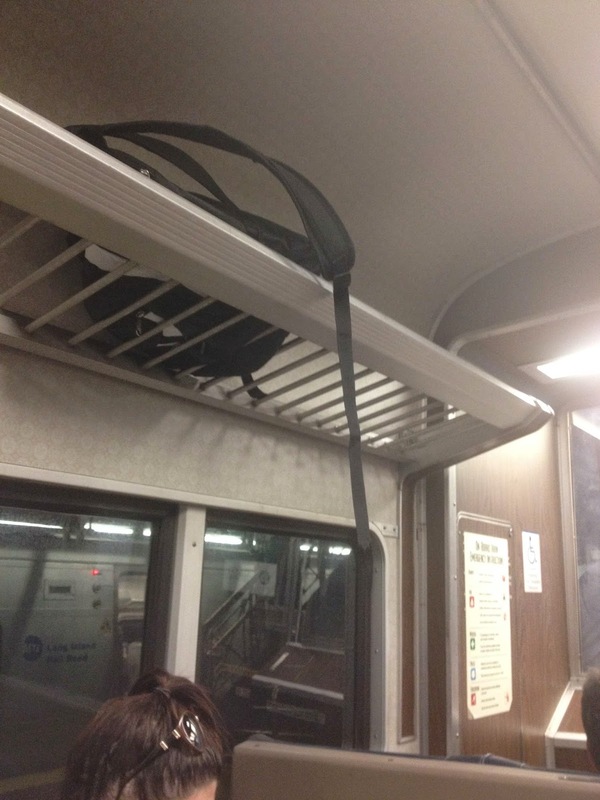 The bag strap hanging down from the overhead rack. The overhead racks are wide open. You can look up and see what's on them from your seat. See the image on the left. Typically, this is not a problem. But sometimes, there's a bag sitting on the rack and the shoulder strap has fallen through the slats, and is hanging above your face. It may not be IN your face, but it's IN your line of vision. Maybe I'll get up and move it. Nah, I'm so comfortable. And I have my laptop open in front of me. Getting up will be a pain. Really, the bag's owner should move it. But he's asleep. I'm obsessing about this strap. I must move it. Ok, I won't bother. "The Strain" TV Show ad. Did you see this vile ad? The show started on some cable network back in the summer, and the ads were both revolting AND widely distributed. I debated posting a photo in this post, so you'd know what I'm talking about, but decided to just share a censored version of it. Look at this! An eye with a worm coming out of it? An ophthalmologist's nightmare. Is this an ad that should have been placed in hundreds of train cars? For a while, every train I went on had this awful advertisement. 45 commuting minutes of yuck. I'm not looking at it. But yet, I keep looking at it. So gross. I never watched the show. I got enough agita from the ad. I'm sure I have other neuroses I could share, but they're buried deep in my unconscious mind to protect my conscious mind. For the good of the blog, I'll go to a shrink and he can pry them out for me. In the meantime, that's all I have. Hope that's enough? Is it enough? I'm so worried that it's not enough. The ad for The Strain was 829 times better than the show. I'm glad I didn't waste time watching it. Only 4 Neurosis - in this day and age that makes you Normal. Blog - no not enough, keep writing. Appreciate your feedback. I knew it wasn't enough. It's just never enough! But don't you worry. I have a HUGE backlog of material.